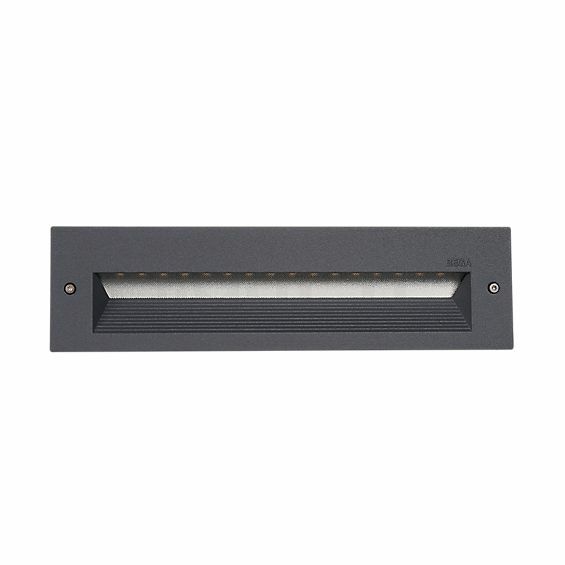 The Bega 33054 recessed wall light LED is characterised by a functional design. With a width of 26 cm and a height of 7 cm, the slender rectangular housing of the wall lamp blends almost seamlessly with the wall. To do so, the 33054 LED requires a wall opening with a width of only 24.5 cm, a height of 6 cm and 7 cm in depth. The wall light by the German specialist for exterior lighting, Bega, is manufactured from cast aluminium, aluminium and stainless steel. The light opening is covered by a sheet of clear safety glass. The Bega 33054 directs its light obliquely downwards. A reflector made of anodised ultra-pure aluminium ensures that a maximum of the emitted light spreads into the surrounding area. Furthermore, the wall light gives off its light in a completely glare-free, softly diffused way. In this way, the 33054 ensures safe orientation in the outdoor area. The wall lamp by Bega has a protection class of IP 65, which means that it is dust-tight and takes no harm from jet water coming from any direction. The integrated LEDs, as well, impress with high quality, as they offer good colour rendering and high energy efficiency. Tell other customers and us about your experiences with the 33054 - recessed wall light LED ! The Bega 33054 LED is mostly used to illuminate stairs, ramps and paths. There, the wall light proves particularly useful thanks to its completely glare-free light that makes the entire area underneath the 33054 LED clearly visible. Thereby, the wall lamp by Bega prevents you from tripping in the dark.